When Ntsiki Biyela won a winemaking scholarship in 1998, she was certainly a curious choice. She had grown up in the undulating hills of Zululand, living in a small village of huts and shacks. People tended their patches of pumpkins and corn. The only alcohol they drank was homemade beer, a malt-fed brew that bubbled in old pots. Indeed, Ms. Biyela had never even tasted wine, nor had anyone she knew. Her choice of study was a fluke. Though she had been a good student, none of her grant applications for college were approved until an airline, hoping to promote diversity, offered to pay her way to study viticulture and oenology: grapes and wine. What was wine? the young woman wondered, guessing it was another name for cider. She had never been outside the eastern province of KwaZulu Natal, but she boarded a bus and traveled across South Africa to the wine country of the Western Cape. She gazed at the immense mountains. She puzzled over the short, thin trees planted in perfect rows. She had no idea what they were. Finally, Ms. Biyela tasted the beverage she had come such a distance to study. She and a handful of other black scholarship students met with a wine connoisseur, Jabulani Ntshangase. He opened a superb red, raised the moist cork to his nose and talked rapturously about the wine’s fruitiness and color and fragrance. She was expecting to sip something sublime when handed the elegant, long-stemmed glass. Instead, she was stunned. It was disgusting. Ms. Biyela, having definitely adapted her tastes, is now one of this nation’s few black winemakers in an occupation that has been dominated by white people for 350 years. Her blends of merlot, cabernet sauvignon and pinotage have won gold medals and four-star ratings. 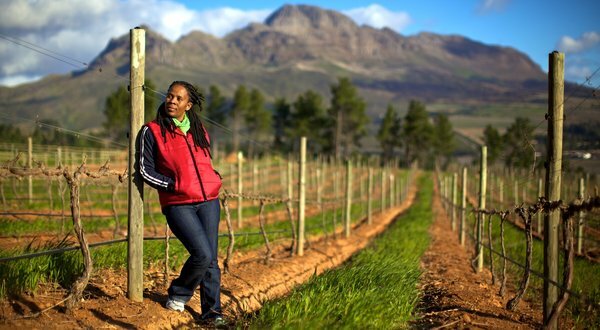 She was named South Africa’s Woman Winemaker of the Year in 2009. Last month, she was busy judging the country’s entries for the International Wine and Spirit Competition. Though apartheid has been swept away, this country is still a racially divided society. Ms. Biyela is a pioneer in its transformation, not someone elevated through political connections, but a rural woman who made it on grit. South Africa regularly ranks among the world’s top 10 wine producers, and while the climate and soils are welcoming to the grape, the industry’s history has dismal chapters. Vineyards were long tended by slaves, and even after emancipation, working conditions remained both horrendous and insidious. In the so-called dop system, laborers were paid partly with a daily quotient of cheap wine. Dependence on alcohol was the boss’s method of control. Things have improved, though hardly by enough in one of South Africa’s showcase industries. Just this week, Human Rights Watch issued a report severely criticizing the working and living conditions in the vineyards. THE country has far more wine than wine drinkers. More than half the production is exported, and even if everything were shipped away, most of the population would barely notice. A large majority of South Africans are black and poor. Beer is their drink, and they are not interested in a lot of conversation about bouquet. No one sniffs the bottle cap. Ntsiki (pronounced n-SEE-kee) is short for Nontsikelelo. Her mother was a maid in Durban who saw her daughter maybe once a year. Ms. Biyela, now 33, was raised by her grandmother in the village of Kwa Nondlovu. Like other young girls, she fetched water each day from a river. She walked seven miles to a forest to gather firewood. She studied in a poorly equipped rural school. Her scholarship was to Stellenbosch University, in wine country. Most everyone on campus spoke a language heavy with “cch” sounds as if they were clearing their throats. This was Afrikaans, the main tongue of the region and the language in which her instructors taught. She did not understand a word of it. During the first year, the courses were basic: mathematics, physics, biology, botany. To her relief, the same subjects were taught to forestry students in English, and she attended classes with them. But the rest of the four-year program was mostly in Afrikaans. She kept up with notes prepared in English. While still a student, Ms. Biyela was given a part-time job at Delheim, a large winery, and this led to her oenological conversion. She not only worked in the vineyards and the cellar but also served wine to visitors in the tasting room and was consequently obliged to discuss what she poured. So she too tasted. She developed her palate. After graduation, Stellekaya, a boutique winery in Stellenbosch, hired her as its winemaker. It was a big leap, and the winery was taking a big chance on someone so inexperienced. A consultant helped her in the beginning, but soon she was on her own. Her very first red blend won a gold medal at the country’s prestigious Michelangelo awards. Most other blacks at the awards ceremony were waiters. They erupted in cheers at the announcement.